When designers such as Gucci and Loewe bet on a garment on the runway, we have no one to make a hole in our closet. This is the case of pleated skirts, which burst harder than ever this season. Although the pleated skirt is a versatile garment, many of us do not dare to take the step for fear of not knowing how to combine it properly. But what makes the pleated skirt a must have in our closet is that we can combine both with extra-large sweatshirts and sports as with lounge shoes. These are ideal for both night and for the day, as you choose whether you want to give a touch more casual or dressy depending on the occasion. Pleated skirt can be found in all kinds of colors and sizes, although no doubt the metallized in mini size are the protagonists of the season. In addition, unlike the pencil skirt, pleated skirt usually fits well on any body type. The problem with the standard pleated skirt is that because it is long, usually does not favor so much in short girls. However, you can always change the height of the waist and raise the waistline so that all of us can enjoy a garment that is comfortable to wear, adds a very feminine and sophisticated look. Keep in mind that with pleated skirts the rules you put them. 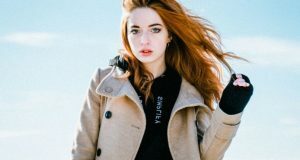 That is, although apparently pleated skirt may seem a pledge to fix, a oversize sweater or a bomber jacket are two perfect options to “downgrade” the festive look of metallic pleated skirt. We should not be afraid to combine different patterns and textures, as a pleated skirt with a striped shirt or lace knit sweater can be a perfect day for a daily look. The pleated skirts world has no limits. Develop your creativity and create endless combinations to show off this season. What are you waiting for? 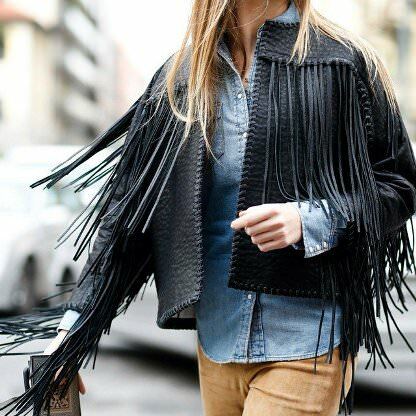 Why all love fringed jacket?